minxeats - recipes, recaps, and restaurant reviews: Talk About Talara - and a Giveaway! 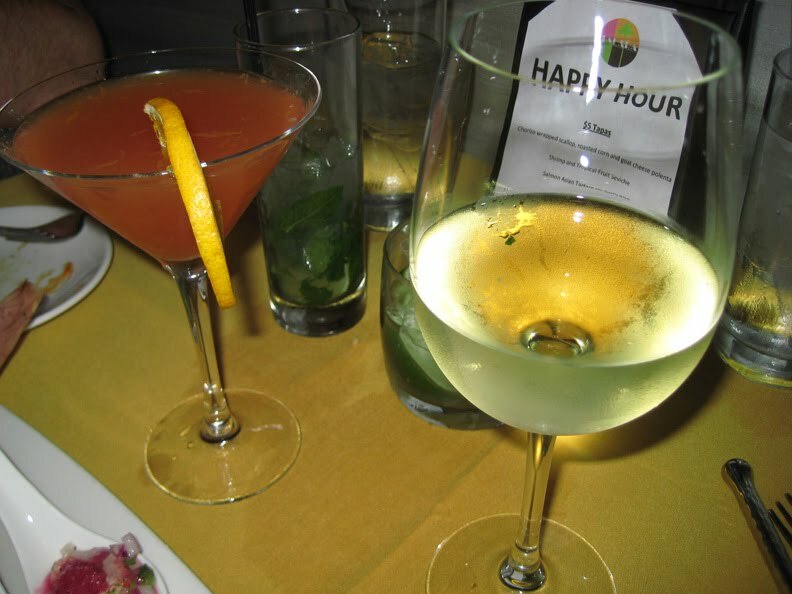 Recently, MinxEats received an invitation to partake in a complimentary meal at Talara, a Nuevo Latino tapas restaurant and Batimore Happy Hour hotspot located in Baltimore's burgeoning Harbor East area. I've mentioned several times that we're big fans of the whole small plates craze so we were more than happy to pay them a visit and sample the seviche (that's pronounced seh-vee-chay). When we arrived, we were greeted by managing partner Nick Rizzo who gave us a tour of the menu, first the drinks, then the food. While he was explaining the various items, we ate, drank, and were merry. It was hard not to be merry with the Latin music in the background that made me want to jump up and dance. Lucky for Mr Minx, his wife did not make a public spectacle of herself. Not by dancing, anyway. Nick started us off with two classic cocktails - the Mojito and the Capirinha, both offered for $5 during Happy Hour. The former has become familiar to most people, a simple but flavorful rum concoction redolent of mint and lime. The Capirinha is a Brazilian cocktail made with even more lime, sugar, and the vaguely tequila-like cane liquor, Cachaça. Both were excellent, but of the two we preferred the fresh mintiness of the Mojito. With our drinks came three of the $5 Happy Hour tapas specials: mini-tostadas with blackened chicken breast; an Asian Tartare of salmon served on thin nori-wrapped sushi rice rolls and topped with white truffle oil, wasabi mayonnaise, Tobiko caviar, and fried lotus root; and a Chorizo-wrapped diver scallop over a roasted corn and goat cheese polenta with tamarind bbq sauce. From the descriptions alone, one can tell that Talara likes to play with their food. Although billed as "Nuevo Latino" the food's cultural influences are many. While I do enjoy authentic food, I'm happier when food just plain tastes good, and Talara gets high marks all around. 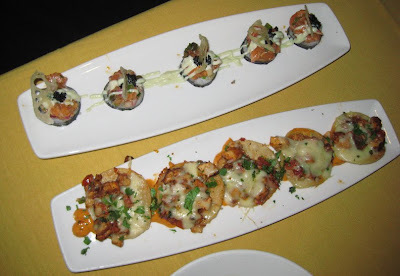 The mini-tostadas were like posh nachos, and the tartare was very fresh. I really loved the whisper of truffle oil on top, an interesting pairing with wasabi's kick. The scallop was perfect - dense, moist, with salty chorizo and a creamy but hearty polenta. Even Mr Minx loved it, and he's not big on scallops. Next up came a sampler of three of the seven varieties of seviche available. 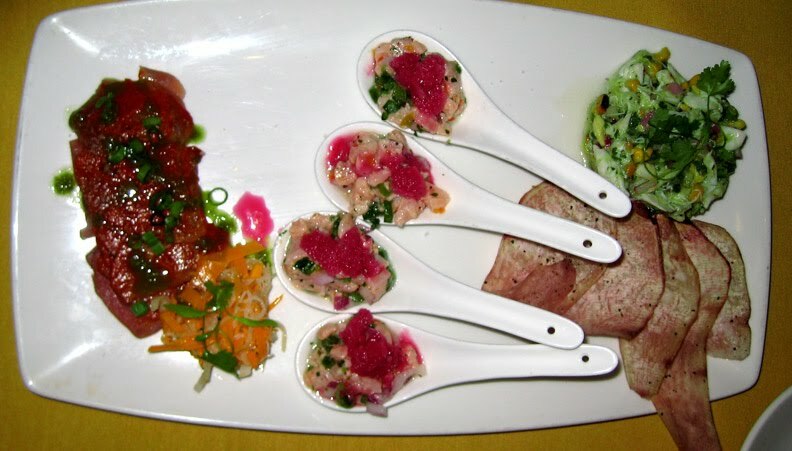 Seven preparations, that is, with several types of raw and semi-cooked seafood with which to mix-and-match. We had the avocado and corn with crab, served with fresh malanga chips; the "Fire and Ice" which is a traditional lime-marinated seviche spiced up with habanero and cooled down with a wee bit of shockingly fuchsia prickly pear granita; and the Tiradito, which is a Peruvian-style sashimi with chipotle paste and a bit of jicama and calabaza slaw. I think the Fire and Ice was my favorite - I loved the explosion of hot/sour/sweet/cold served on a Asian soup spoon and meant to be slurped in one shot. Mr Minx was pleasantly surprised that the smokiness of chipotle went so well with raw tuna (which was extremely fresh and luscious). And what's not to like about avocado, corn, and crab? With the seviche, we tried a blood orange Margarita made with Sauza Tres Generaciones Anejo Tequila and a glass of the Argentinian house white, an Alamos Torrontes. While the margarita was fine, tasting mostly of the high quality tequila, I was more impressed by the wine. Not your typical glass of acid that many places use as their "house" wine, the Alamos was crisp and bright, with low acid and a very nice guava/passion fruit quality. We then tried two "mid plates" so called because while they are larger than tapas, they are smaller than entrées. More like very generous appetizers. But with some seviche and a tapa or two, they are plenty. I was intrigued by the crabmeat chili relleno because my attempt at that dish just didn't work. Also interesting was the idea of lamb ribs. 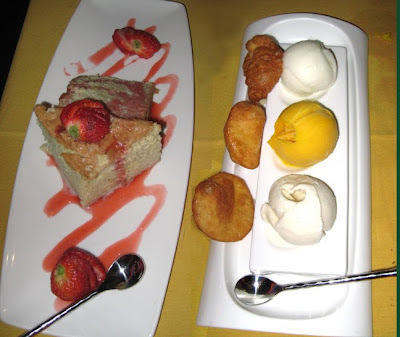 Both dishes were terrific. 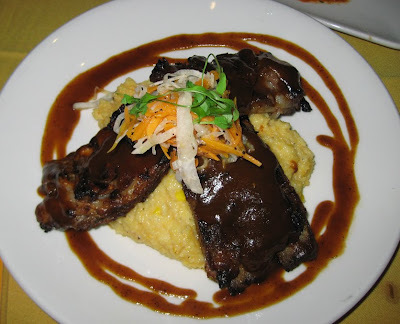 The lamb ribs were fall-off-the-bone tender, very much like pork baby backs, and brushed with the tangy tamarind bbq sauce that came with the scallop, along with more of the same terrific polenta. As for the rellenos - they were like mini Maryland-style crabcakes that just happened to be wrapped in a poblano skin with some crispy tempura batter on the outside. Traditional, yet new. Loved the twist on the traditional rice and beans accompaniment: a timbale of saffron rice studded with black beans. Honestly, I loved everything at Talara. And you know how hyper-critical I can be. The only thing I can complain about is the "Miami Vice" faux deco font used in the restaurant's logo. And maybe the blood orange in the margarita wasn't orange-y enough for my tastes. But other than that...I got nothing. If you're interested in trying Talara for yourself, I can help you along. I have one $50 gift certificate for one lucky MinxEats reader! All you have to do is leave a comment with the name of the Talara dish you would most like to try. You can find the full food menu here (scroll down) and the drinks menu is linked on that page as well. Please make sure to leave your e-mail address in the comment so I can contact you if you are a winner. The prize is provided by Talara, but Talara is not a sponsor, administrator, or involved in any other way with this giveaway. All opinions expressed in the post are my own and not those of Talara. Winners will be chosen by random drawing from the pool of comments received on this post. The contest deadline is Monday June 21st at noon. Everything looks amazing! I have seen this restaurant before but after reading this blog, it makes me want to go! Definitely would get the Crabmeat Chili Relleno! I've been wanting to try this place for ages - heard nothing but great things! The lamb ribs sound decadent - would love to get my mouth around one of those. Let's not kid ourselves, I'd couldn't leave without trying the MD inspired chili rellenos. I am from South, would have to see how they compare with that of TX! Wow! Between your review and the menus, I am definitely in a quandary... but i would love to try Talara's "A Study of Ahi". Its description sounded like the beat of all worlds. Would love to go and take my best guy! Since I'm a sopapilla connoisseur, I'd love nothing more than to try those! I'd love to try the Mussels Cataplana.I love mussels and have never tried Portuguese cuisine.